My mom and I were discussing how Lola needed a pair of skinny jeans and like the great mamah she is, she ordered her some from Baby Gap immediately!! So when my mom came up to babysit and sleepover this week she brought the adorable jeans with her. I wish I looked half as good as Lou in my skinny's!! I wish I looked that good in some skinny jeans! Haha, I have to just giggle every time I see that first picture. I love that Lola girl! Oh my GOSH, she looks so dang cute! 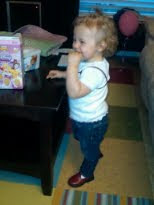 I know, I wish I looked as good in my skinnies too! How adorable! Can you please have 10 more kids so you can fill the world with ADORABLE BABIES!??! SO CUTE! 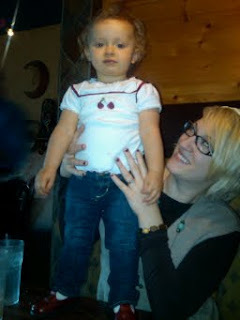 I love babies in skinnies! It's the best! She is so so cute! 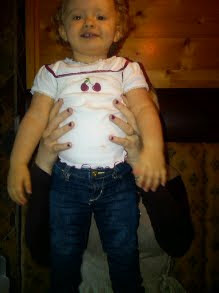 Skinny jeans on babies are the absolute bestest of the best!!! !